Under pressure from demanding applications, increased virtualization and a proliferation of mobile devices, IT organizations are looking for a highly-available, resilient and performant data protection environment that ensures business resiliency and efficiency. However, sourcing products from multiple vendors is costly and can create management complexity that will deter you from deriving maximum value from your infrastructure. Instead, consider a single stack, integrated software and hardware backup solution. 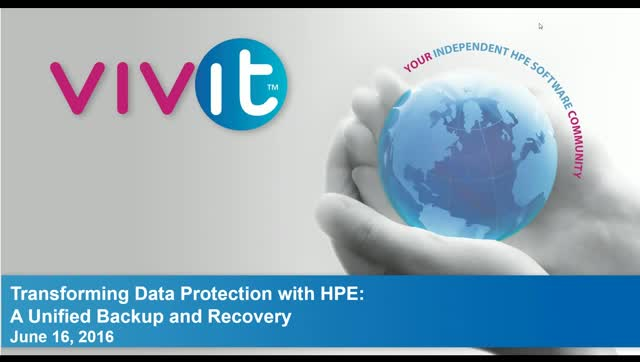 Join HPE data protection experts to learn why more organizations are moving away from fragmented point based solutions to HPE’s unified data protection solutions, and how HPE Data Protector, through native integrations with HPE StoreOnce Systems, HPE 3PAR StoreServ, and HPE StoreEver (Tape) offerings, can provide you with advanced capabilities that accelerate the backup process in a cost-efficient, scalable way. Mike Tyson famously observed “Everybody has a plan until they get punched in the mouth.” The question is, will your Disaster Recovery plan survive that punch and save the day? In this presentation, Jim Whalen of Taneja Group and Dave LeClair of Unitrends will discuss cloud-based Disaster Recovery, how Recovery Assurance is an absolutely crucial component of any DR plan and why choosing a DRaaS provider needs to be on everyone’s short list of options when developing their Disaster Recovery plans. Do you want to learn about new disaster recovery options from Microsoft experts? Have you been putting off trying new technology due to time pressures or not knowing where to start? Do you think your disaster recovery strategy would benefit from a refresh? Register now to watch live or receive notification when this program is available on-demand. Learn how to protect your business against localized disaster, eliminate capital expense, and answer the cloud mandate with Quantum’s newest cloud offering – Q-Cloud Protect for AWS. This webinar will demonstrate how to use the cloud for disaster recovery, as well as archiving and cold storage with Q-Cloud Vault and Q-Cloud Archive. Find out how to leverage the public cloud for data recovery with a solution that plugs into your existing backup environment. - How key management systems work and how to evaluate vendor solutions. This is a non-technical session but will be of value to developers and implementers. Attendees will learn the core principles of effective and secure encryption key management. These principles can be used in developing in-house key management solutions or in evaluating vendor solutions. - What is encryption key management and why is it important? Traditional backup solutions are painfully complex, expensive and prone to failure at the worst possible time. Nasuni Cloud NAS integrates data protection into primary file storage, building a system that eliminates the need for separate backup. Join us to see how Nasuni can help you breakup with your backup and replace it with file storage that integrates data protection that is more cost-effective, easier to manage and far more reliable. Over the past year Microsoft has introduced major new disaster recovery capabilities in Azure. Services like Azure Site Recovery and Azure Backup make it easy to replicate on-premises workloads to the cloud and implement a true hybrid cloud solution. • Azure DR use cases—where have other companies achieved success? File storage is an ever growing costly, complex problem. Files sprawl is out of control forcing organizations to build storage environments with file servers or NAS, backup servers and media, disaster recovery sites, WAN optimization, replication, remote storage, and mobile solutions. Adding insult to injury, these solutions run out of capacity and need expensive upgrades and painful migrations. Cloud NAS does away with all of this by providing local NAS controllers which cache active files from a cloud based file system. This maintains the same user experience and performance, adds collaboration and mobile access, while securely eliminating separate backup, DR and remote data access solutions. Learn how cloud enables file storage with unlimited scale that saves company’s 40-60% of their storage costs and eliminates refreshes and migrations forever. Boost VM performance and reduce backup costs with Veeam 9 and Quantum tiered backup storage. From deduplication, to hybrid storage, to tape, to cloud, learn how Quantum’s portfolio of tiered backup storage works with Veeam 9 to boost VM performance while reducing backup costs. Maintaining a copy of your data in case of disaster is paramount to the continuity of your business. Subscribe to this channel to learn all the best practices, solutions and approaches to making sure you're recoverable when disaster strikes.